In the mini-hubub that came after Ben Smith’s “we don’t do clickbait” piece last week, it became clear that we haven’t yet settled on which arguments we want to have about BuzzFeed, the massively successful and every day more ambitious viral media machine. And it’s worth having the BuzzFeed fight right. It’s huge. It’s well-funded. It’s increasingly becoming one of the most ambitious newsrooms in the country. Most importantly, BuzzFeed is the most sophisticated citizen of FacebookWorld. And now that Facebook is the most powerful distributor of digital media and therefore the de facto arbiter of what consumers want and what publishers should produce, we all live in FacebookWorld. So we should fight well about BuzzFeed in order to understand FacebookWorld. 1. How much is left out of FacebookWorld? 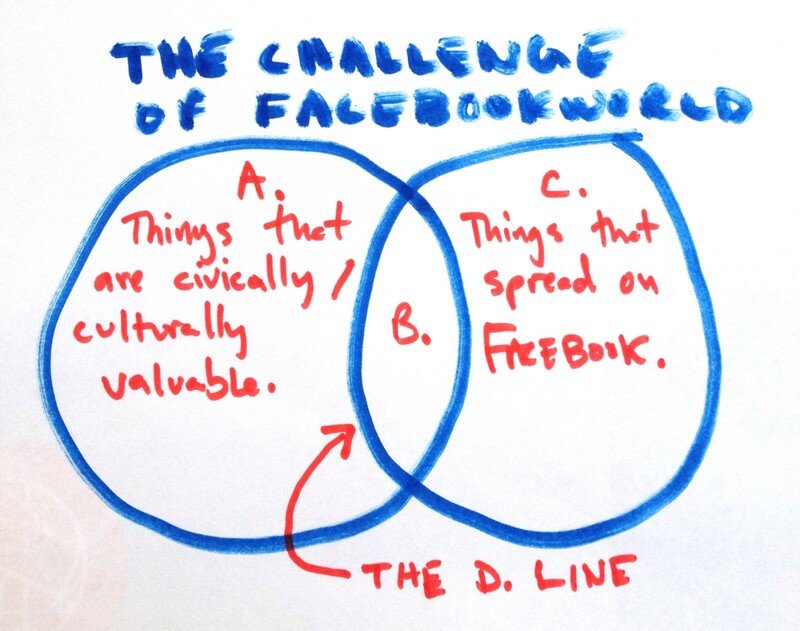 How much in that A circle overlaps with the C circle and gets distributed by Facebook and how much is left trying to reach audiences through less effective means? 2. Has BuzzFeed grown beyond FacebookWorld? When BuzzFeed CEO Jonah Peretti first announced the hire of Ben Smith and the site’s expansion into original journalism, he did it by explaining that it was just a natural extension of his business focused on the C circle. People share original reporting, he told us! We’re a C business, so why why not finish the circle and grab that B section? But in the last year, the site has invested in international reporting, longform features, and investigative reporting. This is pretty traditional A circle, maybe some of which sneaks over into the B section of the graph some of the time, but probably not predictably and only after a lot of $ has been spent. 3. Can BuzzFeed sustain a news mission and a FacebookWorld mission simultaneously? BuzzFeed logo is literally a line chart with an arrow pointing up signifying explosive, Viral Traffic. If the company is now building an A circle business that is dedicated to the news regardless of the C circle, can it define and sustain a mission for it just as clearly and passionately? 4. Will consumers go for a serious news business with the same name as a FacebookWorld business? Call this the “brand” question. BuzzFeed’s brand is powerful: cats, listicles, all that stuff. It’s a C circle brand. But it’s also relatively young. Will consumers adjust and broaden their expectations in a way that allows BuzzFeed’s A circle business to be taken seriously? 5. Where will the $$ lead them? BuzzFeed has taken hundreds of millions of dollars from venture capitalists who I suspect are fine with but not primarily interested in the civic value of BuzzFeed’s work. They want a big exit ($1 billion to Disney?) or an IPO. If the A circle business is being subsidized by the C circle business, how will those events change their mission? 6. Can BuzzFeed make more real news play in FacebookWorld? Which is to say, is the D Line movable? Upworthy has made a mission out of moving it, can/is BuzzFeed’s A business doing the same thing? How far to the left can the D Line be moved? 7. Is FacebookWorld a place we want to live? BuzzFeed is FacebookWorld’s most sophisticated and well-funded citizen. How it can or cannot succeed at producing an A circle business should tell us a lot about how healthy FacebookLand will be for the news business. GM, Vox. VP of Network Development, Vox Media.